Looks great. It does wrinkle but not much. Complete any look, from casual to professional, with this wrinkle-free white dress shirt. This button-up shirt features button-cuff sleeves that allow for shortening the length, going from dressy to casual without the need to change clothes. I am very. very pleased with all of the Amanti shirts that I have purchased here so far. The fit is good, the color holds in the laundry, and they are easy to iron (after a few washings). I know they are perma-press, but I don't have a dryer and his work shirts have to be creased on the sleeves. These shirts are perfect, and the price is definitely right! I ordered the wrong size at first, and the return / exchange policy is easy. My son in law enjoys wearing this men’s wrinkle free dress shirt. It really stays wrinkle free all day long! This is a beautiful white dress shirt. It is wrinkle free and wears great. It is well made and the quality of materials is excellent. My husband loves this shirt and when it is time to purchase another white shirt this one is his choice. We would highly recommend this wrinkle free shirt to our family, friends and anyone else looking to buy a nice white shirt. Needed a shirt that has a normal neck size with extra long sleeve length that washes well. This shirt was exactly as described and is wrinkle free. Nice looking and wearing white dress shirt. You can't go wrong with this one. A white shirt and tie for me is absolutely necessary attire for me when I go to business. Therefore, I require a high quality white shirt. This shirt not only looks exceptional but its also very well made to. The collar for one thing stays in place and holds my tie very well. The texture of the shirt has a fine hand and very soft to the touch similar to a high thread count Egyptian cotton. As I'm a few pounds overweight there is some play in the waist making it roomy enough to live in it throughout my workday and beyond. At the price point it is offered on Overstock it turns out to be one of the best bargains on the website. I bought two of these shirts. I laundered one of them and when pulling it out of the dryer, it was obvious that it not only needed to be ironed (like some wrinkle-free or wrinkle-resistant shirts do), but that it needed to be ironed as if weren't a wrinkle-free shirt at all. Pulling it right out of the dryer it was obvious that it was not even close to looking like it was ready to wear, that is how wrinkled it was. So, I ironed the shirt and tried it on and the fit was horrific. It was way too small. The sleeves were too short and the shirt was tight. I am now in the process of paying to have the unopened shirt returned to Overstock (their return process is a whole other review, believe me! ), and I will be stuck with a shirt that doesn't fit. Like this shirt. Can use stitched on buttons or cuff links. Nice fit and the wrinkle free is a plus. This is a great fitting shirt and the material feels very nice on the skin. The collars a well designed and looks good with are without a tie. Fits very well with a bowtie as well would recommend this shirt to a friend. The collar is really weird on this shirt. "The picture does not show a button down collar but the description mentions one. Please clarify." The collar is not a button down. "Does this shirt have a pocket? Thanks." Hello DebLinehan, this shirt does feature a pocket. Please let us know if you have additional questions. Thanks for shopping with us. Need it for a wedding. "My size is 18 or 18.5 32/33. guess you don't make them?" 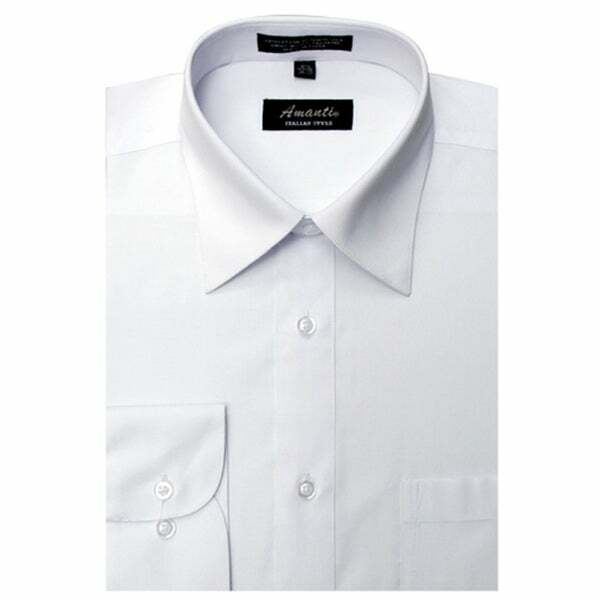 Hello jweaver252, thank you for your interest in the Amanti Men's Wrinkle-free White Dress Shirt. Unfortunately, this shirt doesn't come in 32/33. I am sorry for the inconvenience. Thank you for shopping with us. "I would like to order more of the amanti wrinkle free shirts and u are out of the size I need - 18/36. Do u know if u will be getting more of them soon?"